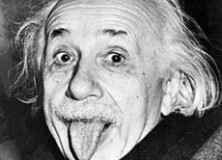 Albert Einstein sticking out the tongue to a neonate in an attempt to test their imitation of tongue protrusion. The nativism-empiricism debate haunts the fields of language acquisition and evolution on more than just one level. How much of children’s social and cognitive abilities have to be present at birth, what is acquired through experience, and therefore malleable? Classically, this debate resolves around the poverty of stimulus. How much does a child have to take for granted in her environment, how much can she learn from the input? Research into imitation has its own version of the poverty of stimulus, the correspondence problem. The correspondence problem can be summed up as follows: when you are imitating someone, you need to know which parts of your body map onto the body of the person you’re trying to imitate. If they wiggle their finger, you can establish correspondence by noticing that your hand looks similar to theirs, and that you can do the same movement with it, too. But this is much trickier with parts of your body that are out of your sight. 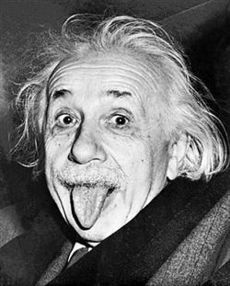 If you want to imitate someone sticking their tongue out, you first have to realise that you have a tongue, too, and how you can move it in such a way that it matches your partner’s movements. Yet since a 1977 study by Meltzoff and Moore, there has been a large body of research that has found that children mimic adult’s tongue protrusions and other oral gestures just hours after birth. The evidence seems to be just as compelling as cute: Dozens of pictures that show an adult caregiver sticking out their tongue, and the child reciprocating. Similar observations were made in chimpanzees (Myowa-Yamakoshi et al. 2004) and rhesus macaques (Ferrari et al. 2006). However, if children are able to imitate their caregivers just hours after birth, then they cannot really have acquired this through social learning. Rather, they must be born with a body map that helps them to establish the correspondence between another person’s movements and their own, even if their own body parts are out of sight (particularly given the limited eye-sight of neonates). Infants will imitate a range of different body parts, i.e. they should imitate more than just one gesture. The stimulus and response should specific towards a single stimulus, e.g. a tongue protrusion will be matched with a tongue protrusion, and not, for example mouth opening. Not all the movements imitated should be a byproduct of other behaviours, such as arousal. As noted, Anisfeld (1991) already noted that only tongue protrusions are reliably matched. This position is corroborated by Ray and Heyes (2011) who note in their review of 37 studies on neonatal imitation of 18 gestures, that only lateral head movement, facial expressions of emotion and tongue protrusion are reliably matched. However for these, simpler explanations exist. Thus head movement may be a side effect of perceptual tethering, facial expressions may be a coding artefact. This leaves us, once again, with tongue protrusion as the only reliable effect. Thus, tongue protrusions may simply represent an attempt of oral exploration towards visually distant stimuli that is mediated by the intensity of the stimulus. Further research revealed that there are tongue protrusions and mouth openings towards flashing lights (Jones, 1996, Experiment 1) or bursts of music (Jones, 2006). Rather, tongue protrusion seems to be a general response to salient stimuli and is modulated by the child’s interest in the stimuli and rates of tongue protrusions do not just decline for behavioural matching, but also for their spontaneous production (cf. Ray & Heyes, 2011). In fact, a longitudinal study of two infants found that tongue protrusions towards interesting objects decrease with the ability to reach objects (Jones, 1996, Experiment 3). 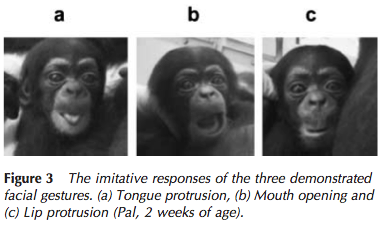 Strangely enough, infants stop imitating adults’ tongue protrusions after 2-3 months. 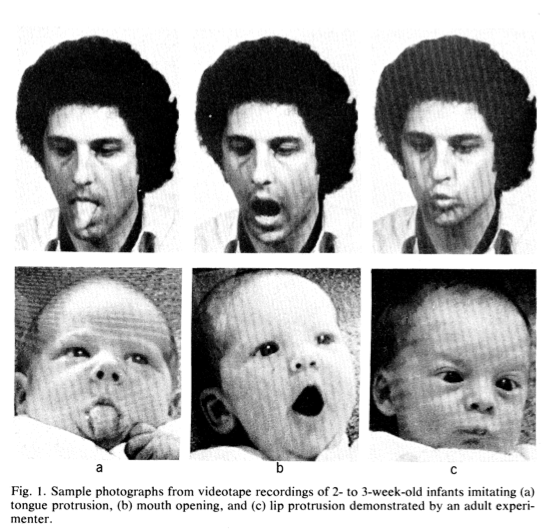 The classic account suggests that neonatal imitation is an involuntary response, and after 2-3 months children learn to inhibit automatic mimicking. They only start to imitate again at one year of age, but this time voluntary and intentionally. Therefore, there is plenty of evidence that suggests we should remain sceptical of the evidence for neonatal imitation. Rather than being prepared to imitate right after birth, infants may only start to imitate at one year of age. This also puts away with that time period between 2 months and one year that infants don’t engage in mimicry. If imitation only sets on late run life, we do not have to explain why they stop it for a few months. Yet the debate is far from over. A recent study by Nagy and colleagues (Nagy et al, 2012) seems to suggest that there are many methodological concerns over whether infants will reciprocate tongue protrusions selectively, even when considering general arousal. Thus they note that “[b]abies imitated both in the ‘lying’ and in the ‘sitting in baby seat’ positions but not when they were held in the experimenter’s hand.” Furthermore they note that the reviews by Ray and Heyes and Anisfeld also included infants beyond the neonatal age of 4 weeks, and included studies of infants that were in the “dormant” imitative period, thereby inflating the number of negative studies… But Note that this study does not cover any forms of other initiation, and therefore some of the criticisms by Ray and Heyes still apply. Depending on which side you find yourself, there are different implications on the developmental origins of human imitative abilities and the implications for human imitation in general. Of course, both accounts also draw heavily on the human mirror neuron system. The account by Meltzoff and colleagues implies that the foundations of human imitative abilities are already present at birth. We are essentially born with a body map that links our own body with the one of other humans, thereby providing the basis for human social cognition from birth. However, this does not imply that these abilities are fully developed. In fact Meltzoff acknowledges that a developmental perspective must be taken into account, thereby refuting a fully nativist explanation. Although the system can detect own and other movements, it is necessary to train body movements in order to fully execute imitative gestures. Thus, ‘body babbling’ can be used to map muscle movements to build up a ‘directory’ Meltzoff & Moore (1997, p. 184) of movements and organ relations. The account by Meltzoff and colleagues implies that mirror neurons are present at birth, and ready to make to establish correspondence. Meltzoff further argues that these early body mappings are also the foundations to human understanding of intentionality and empathy. Through establishing a link between the self and another person (What Meltzoff 2007 calls the “like-me framework”), we can establish that the other’s feelings are like our feelings, and thus learn to understand their actions. In the accounts of Ray and Heyes, as well as Jones, this picture is very different. They propose accounts in which infants do not have an innate predisposition to imitate, but learn to imitate by being imitated. By doing so they can solve the correspondence problem by linking their own actions to someone else’s. For example, Uzgiris et al. (1989) report that mothers of young infants “were roughly five times as likely to imitate their infants as the other way around, and that this proportion had not substantially declined when the infants were 11–12 months old.” (Ray & Heyes, 2011). That way, when they stick out their tongue, or produce a noise (“ah”), and the adult sticks out their tongue, and imitates the noise (“ah”), they would be able to make the first links between their own and others’ behaviours. Here, Ray and Heyes point to evidence that the Mirror Neuron System is subject to learning. For example, Catmur et al. (2008) trained (adult) participants with either congruent or non-congruent behaviour matches, and found subsequent differences in fMRI activations of the Mirror Neuron System, suggesting that the Mirror Neuron System is pretty flexible in learning new connections. Older infants (but not neonates) could learn to solve the correspondence problem in just the same way. Of course, that doesn’t mean that it can’t be present at birth and be subject to learning later in life. Yet which of these accounts is correct depends on whether neonates are actually imitating their caregivers. Confirming or falsifying this observation would be incredibly helpful in answering this question, but despite dozens of studies and just a many pictures of children sticking out their tongue, there is still no consensus in the academic literature. We will have to wait for a few more reviews until we can get a clearer picture. Abravanel, E., & Sigafoos, A. (1984). Exploring the presence of imitation during early infancy. Child Development, 381–392. Jacobson, S. W. (1979). Matching behavior in the young infant. Child Development, 425–430. Meltzoff, A. N., & Moore, M. K. (1997). Explaining facial imitation: A theoretical model. Early development and parenting, 6(34), 179–192. Myowa-Yamakoshi, M., Tomonaga, M., Tanaka, M., & Matsuzawa, T. (2004). Imitation in neonatal chim- panzees (pan troglodytes). Developmental Science, 7(4), 437–442. Nagy, E., Pilling, K., Orvos, H., & Molnar, P. (2012). Imitation of tongue protrusion in human neonates: Specificity of the response in a large sample. Developmental Psychology. P.S. You might have noticed that I haven’t posted on replicated typo before. That’s because I’m new on this blog. So hi, my name is Christian, I’m German, and I have studied Psychology and, as many before me I have taken the MSc in Evolution of Language and Cognition at the University of Edinburgh. Now I am looking for a Phd in developmental psychology and first language acquisition, and/or dialogue. You will find my profile up here soon. Interesting post! Though you mention language acquisition in the first sentence and then never mention the implications this stuff has for language again… You keep talking about “parts of your body that are out of sight” presumably referring to the tongue. But in your sticking-the-tongue-out example the tongue becomes visible. There’s a massively interesting implication for imitative ability regarding the tongue when it’s more hidden, which you don’t explicitly mention, and that is the acquisition of the speech sounds of a language. Babies babble the sounds of their own language from an impressively early age – I realise this probably isn’t straight forward imitation from birth, because there’s the enormous problem to overcome in that the anatomy of a baby’s vocal tract is very different from an adults, as are the sounds that both can produce, so there’s this huge mapping problem that babies manage to crack, and I wonder how innate the ability to tackle this problem is, because it’s not just a case of straight forward imitation, in a way it’s much more impressive. Yes, I absolutely agree: The next question about imitation, how children map their own, more complex gestures, and learn to draw connections between their own actions, to those of their conspecifics, even though they look and sound quite different. I guess the accoutn by Ray and Heyes might be a good a good start as to how that might work. Have a look! I wanted to go into this issue in this article as well, but it turned out rather long, and slightly off the main point I wanted to make – that such a simple, and widely-published finding as neonatal imitation is actually slightly more complicated and still widely contested. I’ll see, if I’ve got time, I’ll be writing an ‘Infant Imitation, part II’. Regarding the visibility of the tongue, I agree (and I keep testing this now since you mention it) – the tongue is visible, but it looks very different. It would be interesting how the own tongue vs. adult tongue looks like to the child. That may be a slightly different visual perspective, given differences in eye sight, attention (I have to actively look down to see my tongue), perspective. The same for eye fluttering, lip protrusion, mouth opening, and finger movement. This happens so early in life that it seems unlikely that infants have learned how to do this. Rather, such behavior must be innate. One might well wonder just how the genes could accomplish this bit of programming. I certainly don’t have an answer to that question. But I can make a suggestion which is grounded in the fact that the human genome is heir to millions upon millions of years of vertebrate evolution. I suggest that the information processing demands of this simple kind of imitation seem to be on a par with the information processing activities of a toad zapping flies out of the air with its tongue (Ewert, 1974). Working in the tradition of Warren McCulloch’s classic account of “What the Frog’s Eye Tells the Frog’s Brain” (Lettvin et al. 1959), Jörg-Peter Ewert studied the visual mechanisms through which a toad distinguishes food from foe and responds accordingly. The visual discrimination is based on simple point and edge configurations, direction of stimulus movement, and contrast between foreground and background. A small horizontal object (i.e. worm-like) moving horizontally is food, to which the toad responds by turning toward it and snapping at it with its tongue. Larger objects and vertically oriented objects signify danger, and caused the toad to crouch in avoidance. It is not too difficult to imagine similar machinery in a human infant being able to detect a pair of eyes or a tongue. An eye is a small colored spot–the pupil and surrounding iris–against a white background, while a tongue is a horizontal pinkish object moving around beneath the eyes. Given that such sights are freely available in the infant’s world, and there are generally no similar sights that are dangerous, it wouldn’t require sophisticated visual processes to identify a person wagging her tongue directly at the infant. I should think that a toad-class visual system would be adequate to the task. And the motor programming which a toad uses to catch worms and flies would seem to be, if anything, more sophisticated than that which allows an infant to protrude her tongue in imitation of an adult’s tongue protrusion–after all, the toad has to hit small moving objects. I am thus suggesting that the human infant’s imitative competence is implemented through perceptual and motor patterns which have been inherited from our reptilian and amphibian ancestors and put to rather different use.